This week Toronto suffered a massive loss with the untimely death of William Jamieson. Known to his friends as Billy, Jamieson was one of the world's foremost collectors of tribal art and ancient artifacts. He died at his home in downtown Toronto on Sunday. The Ministry of Artistic Affairs was scheduled to visit Jamieson's remarkable museum-home in October of this year but now sadly mourns the loss of this most interesting of gentlemen. 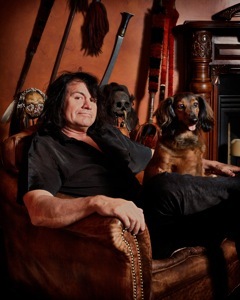 In addition to being a highly respected dealer and collector of objects from cultures around the world, particularly the South Pacific, Indonesia, Africa, and the native peoples of the Americas, Jamieson was well-known for his collection of oddities and curiosities. Reflecting his fascination with the macabre, he will be perhaps most remembered for the real human shrunken heads he collected from the headhunter and cannibal cultures of the South Pacific. Jamieson traveled the world for most of his adult life and through these fieldwork missions gained direct experience with many native cultures, such as the Shuar of Ecuador and Peru and the Irian Jaya of the West Papua province of Indonesian New Guinea. These experiences lead to work consulting for the National Geographic Society on their educational series about headhunting, human sacrifice and cannibalism. He was completing the first season of a series for the History Television when he died. His collection of information, hand crafted tribal weaponry, ceremonial clothing, real human shrunken heads and other artifacts of the Shuar is one of the greatest depositories of information about this tribe in the world. He also leaves behind a remarkable archive of ethnographic material about the native cultures of North and South America, the Dayak of Borneo, the Naga of the Highlands of India and the Batak of Sumatra. In 1999 Jamieson purchased the Niagara Falls Museum which was established in 1827 but had fallen into disrepair and closure by the time of his acquisition. Nine Egyptian mummies that had been in the museum’s collections since 1861 were included in the massive catalog of materials. After Jamieson sold these Egyptian artifacts to the Michael C. Carlos Museum in Atlanta, Georgia, it was confirmed that one of the mummies was that of the missing Pharaoh, Ramses I. After this confirmation by Egyptologists, Ramses I was repatriated back to Egypt where a museum was built to house the mummy in Luxor. A highly social character who radiated friendly energy, Jamieson hosted annual Halloween parties that were legendary in Toronto for the manner in which they brought together disparate downtown social networks; transvestites, artists, curators, Rosedale collectors, horror film production crews and aficionados, celebrities, historians, lawyers, financiers, real estate moguls, fashionistas, dancers, prostitutes, bikers, beer drinkers and hellraisers would pack his sprawling 8,000 square-foot multi-level condo during these raucous parties, 100% of whom were dressed up in elaborate costumes. Bill Jamieson was a truly unique individual. Kind, creative, successful, adventurous, open-minded, non-judgmental and highly enthusiastic, he followed his curiosity to the most remote jungles of the world and returned with stories and tools for learning that he shared generously with us all. His unexpected death is a shock to the Toronto art community of which he was an intimate ally, member and supporter, and we are all reeling from the terrible news. The Ministry of Artistic Affairs wishes to send his family and all who loved Billy our most heartfelt condolences.